Today's small pack bento was made to give supports for the people in Japan. Pray for them to be strong to face what happened in there, never give up hope. Although the tsunami has stopped but the impact of the tsunami will take quite some times for the people and the government to rebuild and restore their homes and the city. I saw from the news last night that earthquakes were still happening in some areas and the nuclear crisis just made so many people worried about it. 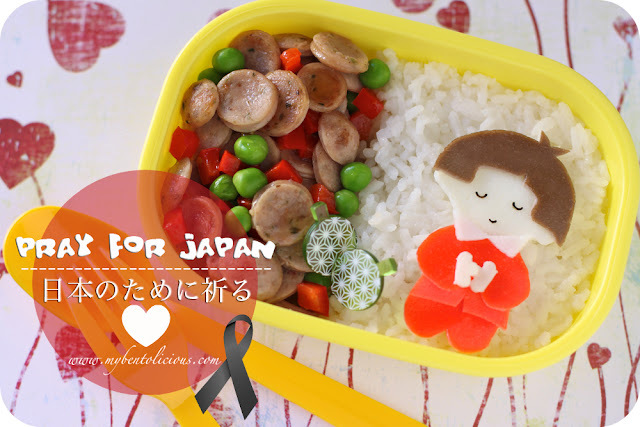 Some bento friends are trying to raise funds for Japan in so many ways. What I can think is a quick money donation sent to IFRC (International Federation of Red Cross). Or you can follow me to make your money donation via PayPal where you can choose from 8 non-profit organizations to put your money donation. PayPal is very secure site and the process is very quick and easy. You can donate starting from USD 5 and choose the non-profit organization that you like from the drop down box at the bottom of the page. And you can get your donation receipt right away on the last step. For Indonesian readers, if you are not familiar with PayPal but still want to make donation, please contact me via twitter or leave a comment with your e-mail address so I can contact you. Then I will explain it to you and guide you step-by-step if needed. I urge all of you who read my post, please support Japan and make your money donation now. As this will be a great help for people there. I remembered what happened in Aceh tsunami on 2004 where many foreign countries including Japan gave so many supports. This time is our turn to give back and helping out. Hi Lia, I can see from his face that he definitely is praying. This is a very thoughtful post of yours and I'll take a look for your links to help. Aw....that's so sweet of you. Yes! Let's pray for Japan! Very thoughtful of you Lia! I'll pray together for Japan! Hope they will get through it! Let's pray for Japan, hopefully they are strong to face this and could recovered soon. So important for us all to do what we can. Thank you for encouraging us all to support the people in Japan as they struggle to recover. I had put your link too as you asked before. Oh yeah, I also want to ask your permission since I want to put your link on my blog-roll. Btw, I wish all the best to people in Japan. Hope they will be strong to face this. @Sya : Sure you can hehehe ... Thanks a lot Sya! Hi Lia, you are very thoughtful and your bento is very 'calming'. I wish to donate through Pay Pal and appreciate ur step by step guidance. Will check out bento4japan too. Thanks. So inspiring bento. Encouraging and support giving! Thanks for the shout out for the auctions! It is good to keep faith and keep hope for the people in Japan. Thank you for blogging about this Lia. It is so thoughtful to encourage all of us to give even if just a little. I know I will continue my prayer too! As always a beautiful post Lia & even more so, how you encourage us all to help out no matter how big or how small. Any which way we can.. Lil is right, keep the faith up and give hope to Japan.. Thank you for your wonderful, heartfelt bento and this post full of information on how to help our sisters and brothers in Japan. You are such a special, talented and caring person Lia! what a wonderful bento, Lia :) Love it. @OhayoBento : Thanks a lot Heather! Hope many people are moved to support Japan :) God bless everyone! Is very thoughtful of you Lia. I've made a small donation to the Red Cross and hope everyone can contribute too.